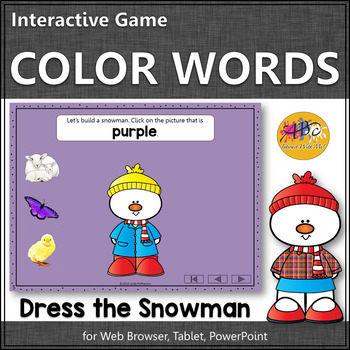 Looking for color word games and activities for your preschool and kindergarten lessons? Reinforcing colors is now fun with this self-checking digital resource! 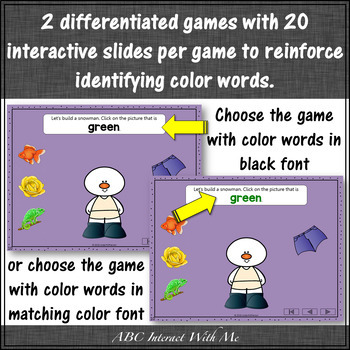 Your students will LOVE the interactive color game! Perfect for a reading center, morning tub or fast finisher task or anytime you are working on reading! Your students will beg to play the game again! The product contains three separate components: two differentiated games and a worksheet. 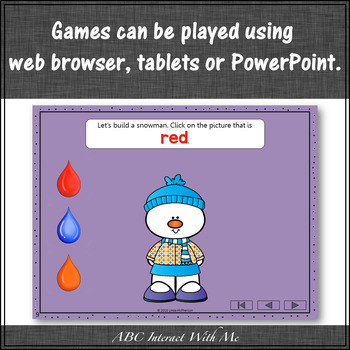 Each game consists of 20 student interactive slides. One game will have the color words written in a matching colored font and the second game will have the color words in a black font! Each gaming slide has several sound effects and animations. Students will read the caption. They will then click on the correct answer! Students will know immediately without leaving the page if they were correct or if they need to look again. Students will love seeing the snowman build right before their eyes when they select the correct answer in this Dress the Snowman game! Two worksheets plus the answer key is included with the product in a 5 page pdf document. 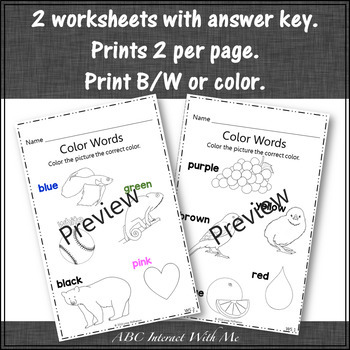 All worksheets will print 2 per page to save on paper. Options to print in color or B/W are included. An excellent observation tool to see which students might be struggling with the concept. The game was designed to be projected onto your SmartBoard, Promethian, Mimio or Interactive Whiteboard and will run on both PC and Mac computers using your default internet browser. It is also compatible for tablets! In addition, the PowerPoint version of the game has been included in the purchase as another option for utilizing the product. Until TpT supports this file type I have stored the data files for tablet and browser on a separate server which allows the graphics and sound effects to remain secure. You will be able to access the game via a provided link. Upon purchase please read the document titled "1 READ FIRST INFORMATION" for detailed instructions. Feel free to check out the preview which is a sample of the PowerPoint version of the product. TpT has size restrictions on previews and I am unable to offer a preview of the Web Browser version of the product. If you would like to see it please email me at ABCInteractWithMe@gmail.com and I will be more than happy to accommodate you. You might be interested in similar products!